China’s exports rebounded from a slump in March and sales to the United States rose despite President Donald Trump’s tariff hikes. Exports rose 14.2% over a year ago to $198.7 billion, recovering from February’s 20.8% contraction, customs data showed Friday. Imports fell 7.6% to $166 billion, worsening the previous month’s 5.2% decline. Imports of American goods plunged 25.8% to $11.3 billion, hit by Chinese retaliatory duties and orders to buyers to find other suppliers. The slump has added to pressure on Chinese leaders to make peace in a tariff war with Washington over Beijing’s technology ambitions. 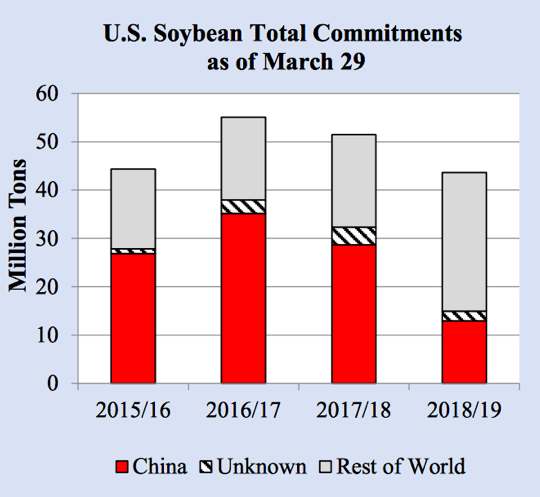 Meanwhile, for the week ending March 29, 2019, U.S. 2018/19 the soybean export commitments (outstanding sales plus accumulated exports) to China totaled 12.9 million tons compared to 28.7 million a year ago.